Crowds of exhausted, ill South Americans crammed inside the church, waiting to receive an envelope. Some had high-blood pressure or elevated sugar levels. Others had skin infections from trudging through the contaminated three-foot high waters blanketing Guyana’s capital, left by torrential rains that began several months earlier in December 2005. Standing in the makeshift medical clinic, John Mitchell, M.D., examined patients and — depending on their case — slipped a supply of antibiotics, diabetes or high-blood pressure medication into an envelope. As he worked to treat flood-related diseases, the director of the trauma program at Geisinger Community Medical Center noticed prevalent health problems: club foot and scoliosis. Since the March 2006 trip , Dr. Mitchell has returned to his native land at least twice a year with medication, medical equipment and a group of other physicians and volunteers. He’s scheduled to leave for Guyana on Saturday with other members of the Health and Educational Relief, a nonprofit dedicated to help institutions in the South American country deliver health care. During the nine-day trip, Dr. Mitchell will visit communities across the country, educating physicians on techniques and offering surgical and medical care. 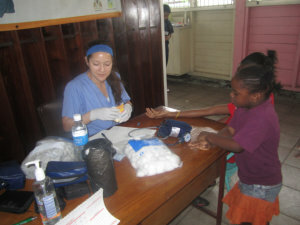 Similar to most third-world countries, Guyana lacks both adequate health care personnel and medical resources, he said. He compared the technology at country’s hospitals to what the United States had in the 1970s. As part of its surgical program, the group launched a club foot project. The teaching emphasizes correcting club foot before a child reaches 6 months old, when major surgery is likely required. The fix requires moving the baby’s foot, which is extremely flexible, into the correct position and then casting it and recasting it about every week, he said. While out in the communities, volunteers stress the importance of taking medication on schedule. Transportation issues often make it difficult for most to visit the hospital every three months and pick up free supplies, so many patients just take smaller medication doses. The high demand for heath care services restricts physicians’ time to educate patients, meaning many don’t understand the importance of routine checkups, nutrition or how to manage a chronic disease.